Updated ADA guidelines were recently published in Annals of Internal Medicine April 2017. First line therapy is still metformin, while the second and third line agent would depend on an open discussion between the patient and physician; regarding side effects, cost, convenience, hypoglycemia risk, route of delivery, as well as secondary benefits like weight loss, and improved CVD and blood pressure profile. This clinical modality is often called a "shared decision making" and "patient-centered" approach. Metformin, if not contraindicated and if tolerated, is the preferred initial pharmacologic agent for the treatment of type 2 diabetes (A rating). Long-term use of metformin may be associated with biochemical vitamin B12 deficiency, and periodic measurement of vitamin B12 levels should be considered in patients treated with metformin, especially those with anemia or peripheral neuropathy (B rating). Providers should consider initiating insulin therapy (with or without additional agents) in patients with newly diagnosed type 2 diabetes who are symptomatic, have a hemoglobin A1c (HbA1c) level of 10% or greater, or have a blood glucose level of 300 mg/dL or greater (E rating). If noninsulin monotherapy at the maximum tolerated dose does not achieve or maintain the HbA1c target after 3 months, adding a second oral agent, a glucagon-like peptide-1 (GLP-1)–receptor agonist, or basal insulin should be considered (A rating). For patients with type 2 diabetes who are not achieving glycemic goals, insulin therapy should be instituted without delay (B rating). A patient-centered approach should be used to guide the choice of pharmacologic agents (E rating). Metformin monotherapy should be initiated at the time of diagnosis of type 2 diabetes for most patients unless there are contraindications. It is effective, safe, and inexpensive and may reduce the risk for cardiovascular events and death. A large meta-analysis supports the use of metformin monotherapy as first-line therapy. It may be safely used in patients with an eGFR as low as 30; the U.S. label of metformin was recently revised to reflect its safety in patients with an eGFR of 30. Gastrointestinal side effects are common in patients receiving metformin. In the authors' experience, these side effects can be reduced if metformin monotherapy is started at a dose of 500 mg once or twice daily with food and titrated gradually to the maximum effective dose (2 g/d). Patients should be advised to stop taking their medication if they experience nausea, vomiting, or dehydration. The Diabetes Prevention Program Outcomes Study found that long-term users of metformin may develop vitamin B12 deficiency. Periodic testing of vitamin B12 levels should be considered in metformin users, especially those with anemia or peripheral neuropathy. If the patient does not tolerate or has a contraindication to metformin, another option should be considered. The ADA/European Association for the Study of Diabetes position statement recommends a patient-centered approach, including assessment of efficacy, hypoglycemia risk, effect on weight, side effects, cost, and patient preferences. 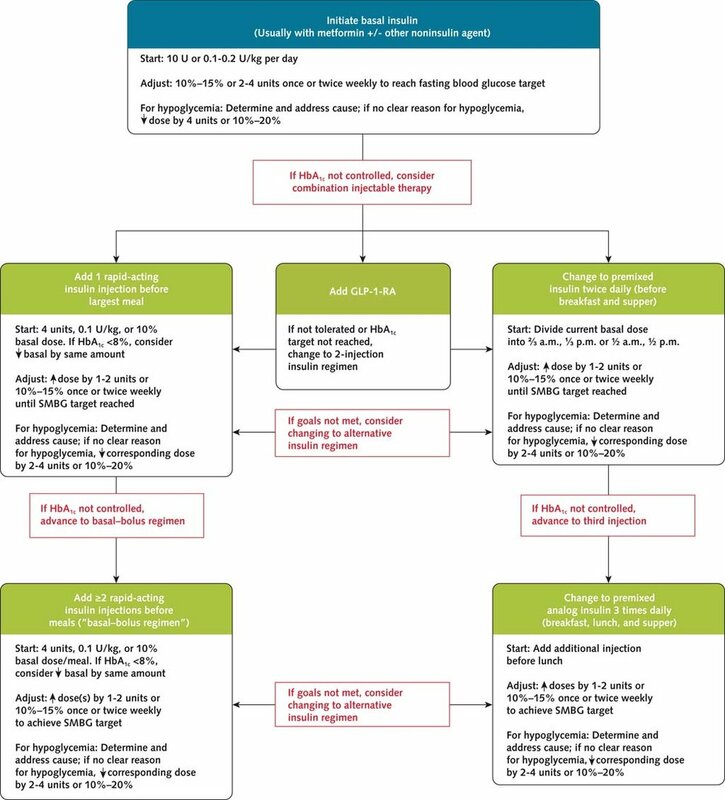 For patients with an HbA1c level of 9% or greater who are not acutely symptomatic, initiation of dual combination therapy should be considered to more quickly achieve the target HbA1c level. If the patient has a random glucose level of 300 mg/dL or greater or an HbA1c level of 10% or greater and has acute symptoms of polyuria, polydipsia, or weight loss, combination therapy that includes insulin should be considered. Providers should assess whether the HbA1c target has been achieved within approximately 3 months of therapy initiation; if it has not, therapy should be intensified. They should use shared decision making and a patient-centered approach when selecting a second agent. Potential combination therapies include a sulfonylurea, thiazolidinedione, dipeptidyl peptidase-4 (DPP-4) inhibitor, sodium–glucose contransporter-2 (SGLT-2) inhibitor, GLP-1–receptor agonist, or basal insulin. Insulin should also be considered as part of any combination regimen for patients with severe hyperglycemia, especially if symptoms or catabolic features (such as weight loss or ketosis) are present. Patients should be reassessed within 3 months for achievement of the HbA1ctarget. Major cardiovascular outcomes trials have studied patients with type 2 diabetes and established cardiovascular disease, including EMPA-REG (Empagliflozin Cardiovascular Outcome Event Trial in Type 2 Diabetes Mellitus Patients) and the LEADER (Liraglutide Effect and Action in Diabetes: Evaluation of Cardiovascular Outcome Results) trial. These 2 studies found that, compared with placebo and standard treatment, empagliflozin and liraglutide reduced composite outcomes for myocardial infarction, stroke, and cardiovascular death in populations in which most, if not all, patients had established atherosclerotic cardiovascular disease. Whether other agents in the same class as empagliflozin and liraglutide have similar benefits, and whether the treatments benefit patients at lower risk for cardiovascular disease, is unknown. Cardiovascular outcomes trial data for the DPP-4 inhibitors sitagliptin, saxagliptin, and alogliptin showed no statistically significant differences in rates of major cardiovascular events between treatment and placebo groups. In May 2015, the U.S. Food and Drug Administration (FDA) issued a warning that SGLT-2 inhibitors may lead to ketoacidosis in the absence of significant hyperglycemia (termed “euglycemic diabetic ketoacidosis”). Patients who develop symptoms of ketoacidosis, which may include dyspnea, nausea, vomiting, and abdominal pain, should stop taking SGLT-2 inhibitors and immediately seek medical attention. In April 2016, the FDA also warned that the DPP-4 inhibitors saxagliptin and alogliptin may increase the risk for heart failure, especially in patients with preexisting heart failure or renal impairment. Diabetes is a progressive condition, and many patients with type 2 diabetes eventually require and benefit from insulin therapy. Early patient education about expected disease progression, and avoidance of threats of future insulin therapy (because it makes the expected transition more difficult), is important. Comprehensive education about blood glucose monitoring, nutrition, and hypoglycemia recognition and treatment are critical to patients receiving insulin therapy. Empowering patients with self-titration algorithms based on self-monitoring can improve glucose control in those with type 2 diabetes initiating insulin therapy. A safe and simple approach is to prescribe 10 units, or 0.1-0.2 units/kg of body weight, of basal insulin per day and advise to increase the dose by 10% to 15%, or 2 to 4 units, once or twice weekly until the fasting blood glucose target is met. Insulin is typically used with metformin and sometimes 1 additional noninsulin agent. Cost considerations are important when an insulin product is selected, particularly because of substantial price increases over the past decade. Although newer products cause less hypoglycemia, intermediate-acting insulin (neutral protamine Hagedorn [NPH]) may be a more affordable option for some patients. Advancing insulin therapy for patients not achieving HbA1c goals on optimally titrated basal insulin alone often requires premeal insulin dosing. The rapid-acting insulin analogues are preferred because of their quick onset of action. The recommended starting dose of mealtime insulin is 4 U per meal, 0.1 U/kg per meal, or 10% of the basal insulin dose per meal if the HbA1c level is less than 8%. Providers should consider decreasing the basal insulin dose by the same amount of the starting mealtime dose. Premixed insulin products containing both basal and bolus insulin are another option for patients who may benefit from simpler dosing. These contain a fixed proportion of basal and prandial insulin to target both fasting and postprandial glycemia. The main disadvantage is that this approach requires a relatively fixed meal schedule and carbohydrate content per meal. Several concentrated insulin preparations are available. The U-500 formulation of regular insulin is, by definition, 5 times as concentrated as the U-100 formulation. The former has a delayed onset and longer duration of action than the latter and has both prandial and basal properties. U-500 insulin is indicated for patients requiring more than 200 units of insulin per day. U-300 glargine and U-200 degludec have longer durations of action than their U-100 formulations, which allow for higher doses of basal insulin per volume. The FDA has also approved a concentrated formulation of rapid-acting insulin called lispro U-200, which may be more suitable for some patients because the volume of insulin being injected is significantly less than U-100 insulins. It may also improve adherence for those who require large doses of insulin. However, concentrated insulins may be more expensive than U-100 insulins. Although U-500 regular insulin is available in both prefilled pens and vials, other concentrated insulins are available only in prefilled pens to minimize the risk for dosing errors. In July 2016, the FDA approved a dedicated syringe for administering U-500 regular insulin from vials to help mitigate the risk for dosing errors. Inhaled insulin is available for prandial use with a more limited dosing range. It is contraindicated in patients with chronic lung disease, such as asthma and chronic obstructive pulmonary disease, and is not recommended for smokers or those who recently stopped smoking. It requires spirometry to identify potential lung disease in all patients before and after initiation of therapy. If basal insulin has been titrated to an acceptable fasting blood glucose level (or if the dose is >0.5 U/kg per day) and the HbA1c level remains above target, combination injectable therapy should be considered. When this therapy is initiated, metformin therapy should be continued but other oral agents may be discontinued on an individual basis to avoid unnecessarily complex or costly regimens. Sulfonylureas, DPP-4 inhibitors, and GLP-1–receptor agonists may be continued or added to basal insulin therapy but are typically discontinued if a basal bolus or multiple-dose premixed insulin regimen is used. In patients with suboptimal blood glucose control, especially those requiring large doses of insulin, adjunctive use of a thiazolidinedione or SGLT-2 inhibitor may improve control and reduce the amount of insulin, although potential side effects should be considered. Once an insulin regimen is initiated, dose titration is important; dosing adjustments may be necessary in both mealtime and basal insulins, based on blood glucose level and an understanding of the pharmacodynamic profile of each formulation (that is, pattern control). Further options for treatment intensification include adding a single injection of rapid-acting insulin analogue (lispro, aspart, or glulisine) before the largest meal, adding a GLP-1–receptor agonist, or stopping basal insulin and starting twice-daily premixed (or biphasic) insulin (such as 70/30 NPH/regular insulin mix, 70/30 aspart mix, or a 75/25 or 50/50 lispro mix). Administration is usually before breakfast and before dinner. A final option is once- or twice-daily 70/30 degludec/aspart mix taken before meals. Studies have shown the noninferiority of basal insulin plus a single injection of rapid-acting insulin administered at the largest meal compared with basal insulin plus a GLP-1–receptor agonist or 2 daily injections of premixed insulins. Basal insulin plus a GLP-1–receptor agonist is associated with weight loss and less hypoglycemia but may be more poorly tolerated and expensive than regimens using insulin alone. The FDA recently approved 2 once-daily, fixed-ratio combination products containing basal insulin plus a GLP-1–receptor agonist: lixisenatide + insulin glargine, and liraglutide + insulin degludec. Both approaches have advantages and disadvantages. Providers can consider regimen flexibility when devising a plan for the initiation and adjustment of insulin therapy for patients with type 2 diabetes. For example, rapid-acting insulin offers greater flexibility in meal planning than premixed insulin. If one regimen does not achieve HbA1c targets (for example, basal insulin plus a GLP-1–receptor agonist), another regimen should be considered (for example, basal insulin plus a single injection of rapid-acting insulin or twice-daily premixed insulin). Regular insulin and 70/30 NPH/regular insulin mix are less costly alternatives to rapid-acting and premixed insulin analogues, respectively, but their pharmacodynamic profiles may make them suboptimal.